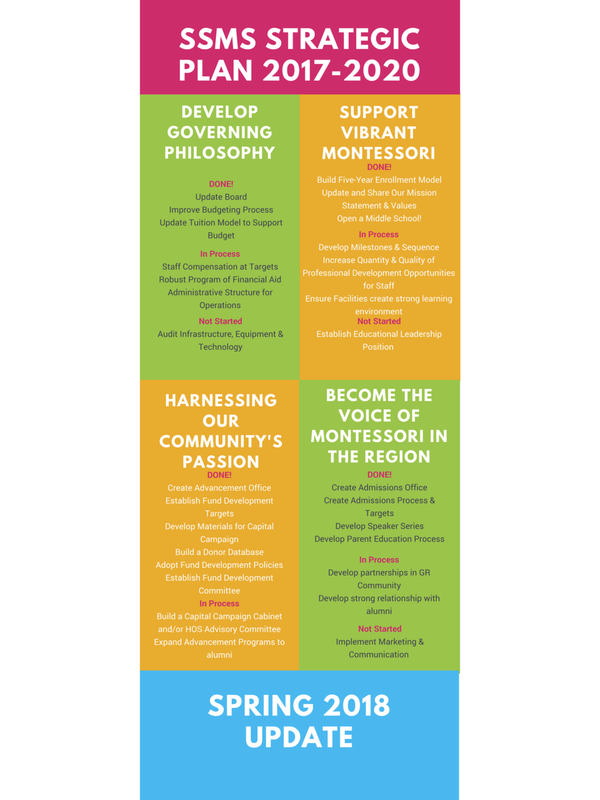 On behalf of all of the educators and staff, Welcome to Stepping Stones Montessori for the 2018-19 Academic Year! As a parent, you’ve signed up for a cosmic education for your child. Around here, we don’t think of ourselves as a school. We think of ourselves as partners in a child’s cosmic journey. Our work is intended to save humanity and bring about peace. The challenge is to truly hold that out front rather than allowing our inner cynic or realist to invade, clamoring that this is impossible! Why not focus on something realistic! Let’s face it. Something as big as an “education capable of saving humanity” is difficult to imagine, and it is hard to see the whole thing at once. When even our imaginations fail to see the picture, our human tendency is to make the dream smaller. We naturally tend to resize it, to think of its components, and to focus on the small things we can understand. When we do, we diminish the ourselves and the children in our school. It is a mistake and error to forget the big and beautiful quest we are on. Even though I know this, there will be times when I will fail to focus on the vision of an education capable of saving humanity. In my desire to take care of the school and our children and adolescents, I will focus on academics, or independence, or grace and courtesy. All of those things are tremendously important to our mission, but individually, one does not take precedence over the others. Only in the context of this larger goal—saving humanity and bringing about peace—do those concepts have a place. I think this happens, in part, because I was educated in traditional schools, and our culture tends to think of education with that kind of model. Under this model, the school and its teachers are responsible for “teaching” a child. Teachers are evaluated based on their students’ performance, rather on their own capabilities in the classroom. The truth is that teachers cannot control whether children learn. Likewise, our school is not in control of their learning. You’re not either. They are. You get the picture. It is the same mistake most parents make, only to be brought to their knees by a crying, sleepless infant, or a pre-schooler’s tantrum, or an adolescent’s moodiness. We are not in control. The children and adolescents of Stepping Stones Montessori come to us with everything they need to learn. Their curiosity, their desire, their work results in their education. Of course, our efforts matter, but they are more about shaping an environment and culture where students realize their own growth—learning, spiritual development, individual value, and a place in the world. Despite this, every year I think that we must do x, or y, or z to make children learn, become kinder, behave in a certain way. The moment comes when I forget that in the end, we are helpless to determine what the child absorbs, learns, retains. We can only offer the environment. In return for your grace on these two things, I will offer my own. You will also make these same mistakes. They go along with being human. As we set off on this path, I ask you (and colleagues, friends, and students) to gently remind me that this education is vast and not to make it too small. I ask you to help me remember that I’m not (nor is anyone other than the child) in control of a child’s learning. I will do my best to return that favor. It is natural and good that at the end of a school year, we reflect on it. What went well? What did we achieve? How are we doing against our strategic plan? How is the balance sheet? I’m glad to have the opportunity to share some of that with you now. But, before I do, I want to reflect first on how we make progress around here. I could tell each child here one hundred times per year that we respect them. I could tell them one hundred times that we seek peace. I could tell them one hundred times how capable they are and how much faith we have in them. Even if I spoke those words one hundred times into each child’s ear, it would not make them feel respected, or peaceful, or confident. Nope. It wouldn’t be enough to do that. Instead, it is the accumulation of thousands of small things that add up to feelings of confidence, respect, and peace. It is the hundreds of times someone smiles with them when they achieve that next step. It is the way that adults speak to them—with eye contact, quietly, respectfully, with intense interest and with deep engagement. It is the way guides and friends work next to them when things get tough. It is the openness of others to their ideas and help that empowers them. It is the tone of voice when anything is spoken, the care in the gaze of a guide, and the willingness to be flexible in response to that student. It is the meticulous care to create and maintain a physical environment that is responsive to the student. Those things are the most difficult to measure and they are the most difficult to offer with consistency, with certainty, one hundred percent of the time. But those things, more than what we say, are needed in order for a child to become a student and then a learner. The same is true of our school. I will share with you the attached snapshot state of our school, and our progress on our strategic goals, because WOW! we’ve made progress! Even if we had accomplished nothing else, we could take great pride and satisfaction in the growth of our program into Middle School. And, even better, it is a farm-based Middle School, with two amazing guides already on board, and 100% of our graduating 6th years in attendance, plus some new families!!! The truth is that we’ve accomplished that and much more. It is, however, impossible in one note to tell you about all of the small things that have added up to these results. I cannot name all of the people who have made these accomplishments possible because each person is influenced by and has become better because of countless more. All of you have participated in this growth, just by being a member of this community. Through your tone of voice, your willingness to help when things seem overwhelming, and your flexibility in response to an idea or a change, you have let us know that you’re with us. Thank you for that generous gift and for sharing your children with us. It is a privilege. I wish you the best summer, and I look forward to seeing you at our Annual Meeting on September 19, where will review our Fiscal Year in depth! A few weeks ago, I wept at work. That’s not my usual style, so let me fill you in. The elementary students were auditioning for our spring opera, Sing Me Home. Every student gets a part, and the auditions are used to help cast roles. It is a pretty vulnerable experience. The students had all been practicing together We are All One Family, one of the main songs for the opera. This practice had been happening for weeks. Now, though, each student sang the song solo in front of the entire elementary student body. I can’t imagine singing in a front of my peers, especially in a solo manner. One of our first year friends stood in front of the group. The music came around, but she did not sing. The music came around again, and still she did not sing. The kids started calling out encouragement, but it was clearly one of those overwhelming moments, and she was not going to sing. Then, one of the upper elementary students stood up. He walked over to our friend and said, “Can I sing with you?” Together, standing shoulder to shoulder, they sang the song. It was the ultimate example of what happens when one person joins another. What was overwhelming in one moment became manageable with some help. After singing together, our younger friend sang it on her own, with courage and bravado, and with the knowledge that a friend was with her. This was a powerful testament to the power of help and partnership. Those things that we cannot do alone, we can do together. This, more than any performance is the power of opera. And, I was weeping with just how powerful that moment was. Right now, our school is in a similar moment. We need your help to do something that we cannot do on our own. In the next couple days, you will be receiving a letter from another parent asking you to join them in supporting our Spring Appeal for the Lifelong Learning Fund. This appeal is our school’s largest fundraiser, and it helps cover the gap between tuition and the cost of operating the school. The funds raised directly support opera, teachers’ professional development, and financial aid. For a small school like Stepping Stones, every dollar matters. Most of the gifts we receive are smaller gifts, and those add up to create great opportunities like the one I mentioned above. Like I said, we cannot do this without you. In fact, our most important goal with regard to this years’ Spring Appeal is to have a majority of our families participate. Even better, we have a $37,000 matching fund for donors through the end of May! That means that every gift—whether it is $5 or $5,000 will be matched dollar for dollar and will be doubled. I hope you’ll join me in making this a great Spring Appeal! Keep an eye out during carline and on our Facebook for progress metrics! Thanks for standing with us and for jumping in with our school. We appreciate all the many ways you’re our partner in our endeavors. I hope to see you at 6 PM this Friday, May 11, for our opera. I can assure you that every student in the performance has the support of their friends and fellow-students!